I saw this “ice sculpture” on this blog’s Juggling With Kids facebook page and thought it looked like a lot of fun. You take a large piece of ice and melt it with salt and add food coloring too. The colors spread through the ice. 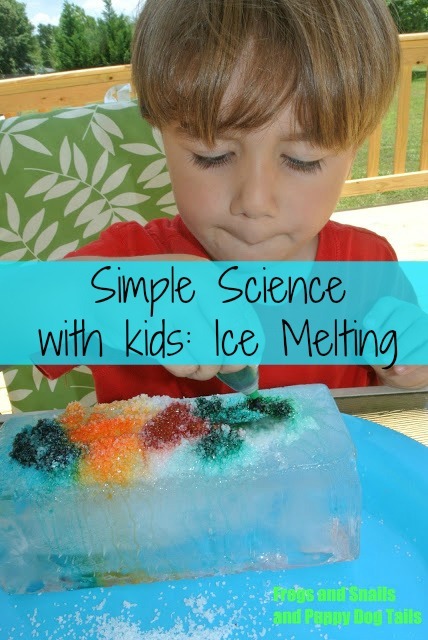 Simple science with kids to show them how salt helps melt ice. I had 2 empty creamer cartons and filled them with water and put up in the freezer for a day before I had time to get them back out. Well, we finally got them out this week and tried this out. Here is what we did. Ice block( take empty milk carton or other carton and fill with water and freeze), kosher salt( other salt may work), food coloring, tray or pan). Take the ice block out of the milk carton and place on a pan. Then pour salt on top and add food coloring. Last, wait to see the color seep through the ice. What we ended up with in picture above. My son was so excited to touch the ice and salt. And more color, add as many as you want. His face, love it. He was really into this. I was hoping for more color to seep through but it didn’t. Hope to try our other block out soon and see if it comes out any different. We had fun trying this activity out and look forward to trying it one more time. Hope you and your family can make your own ice masterpiece. Ohhh this looks so much fun. We haven’t done any ice play at all this summer it’s been way to cold. But will have to try next time we have a warm day. Your ice sculpture is so lovely. We enjoy playing with ice too! Neat project! The photos are very cool too! Oh, so fun!! We will definitely have to give this a try. Thank you for sharing at Sharing Saturday! !